The black Lens Cover For the Sony SAL-70400G 70-400mm f/4.0-5.6 G SSM Lens from LensCoat is a 100% closed-cell neoprene coat that protects the lens from bumps and scratches. It is ideal for nature, outdoor photographers, sports shooters and photojournalists. It also provides a thermal barrier, protecting your hands from cold lenses in lower temperatures. The cover is waterproof, providing protection in inclement weather. This cover comes with an optional piece for when the lens is zoomed out to 400mm that can be quickly and easily put on and removed with its touch fastened attachment. This version comes in a matte all-black finish to better blend in where desirable. Or, it can be used just for its protection value. Box Dimensions (LxWxH) 9.0 x 8.6 x 1.9"
Lens Cover For the Sony SAL-70400G 70-400mm f/4.0-5.6 G SSM Lens (Black) is rated 3.2 out of 5 by 5. Rated 1 out of 5 by Ferd Que from Disappointed I expected more from this product. While it will protect the lens from scrapes and scratches the fit and usability of the product leave much to be desired. It is essentially 7 pieces of neoprene cut into various shapes and sizes. The cuts are not straight making the pieces rub each other in places as you zoom and focus (and eliminating any hopes of water-tightness). The hood piece does not fit the contour of the hood well; blocking some areas, leaving the hood exposed in others. The controls, esp. the focus limiter, become nearly impossible to operate with the cover in place. The end piece overlaps the lens mount providing interference when attaching the lens to the camera. Rated 4 out of 5 by Norman from Nice protection for lens Fits the lens well. 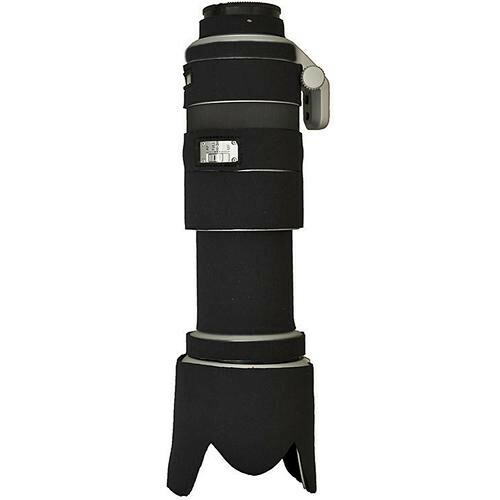 Because the lens extends when going out to 400mm, there is a piece that attaches to the extension with velcro. It's really the only way to cover this section, but it can be awkward at times. Still very glad I have the lens coat. It hides the big grey lens that frightens birdlife and tourists. Rated 5 out of 5 by Anonymous from Works Well Lens Cover fits well and provides the protection and camouflage for the lens as required. Rated 2 out of 5 by Mark from Disappointed This cover is in so many pieces and takes way too long to put on or take off. One piece at collar requires permanently sticking it on. The zoom tube extension cover doesn't allow any backing off from say 400mm to 300mm which I often do. The switch from MF to AF is not useable even though they put a clear plastic window but you can't grip the switch. Focus hold buttons can't be seen. For the money it costs I would think a better design could be made. To me a one piece loose sock over the lens would work just as well and give better coverage. Manual focus might be difficult but for me not an issue other then small adjustments and at least I could back off on the zoom easier. It could slip on and off easy, give better protection or camouflage and be made much cheaper and generic for most lens. For me it was a disappointing purchase and I'll check my sock drawer for something better. Maybe it's just because I don't want permanent camo on my lens and just see a need once in awhile. Rated 4 out of 5 by peter from Good produce The produce is good and it does the job but the fitting could be better.